Auto Shazam, the feature that launched in May to turn our iPads into always-listening music matchers, has now arrived on iPhone and iPod Touch for both free and Encore Shazam users. If we have one frustration with Shazam, it's getting the app up and running in time to catch the final few seconds of that TV advert which keeps getting away. 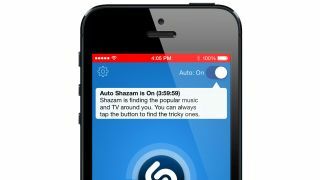 Auto Shazam solves that problem by identifying songs and TV content without you even having to touch your phone. It'll work when the app is open or when it's running in the background, even if the screen is locked. When a match is made the song or TV adverts and shows will automatically be added to your collection by order of date. Currently Shazam's TV show features only work fully in the US, functioning on a selective basis in the UK. Auto Shazam is set to "off" by default so you'll need to flip the Auto switch at the top of the Shazam home screen to start it up. Of course, there are likely to be two points of concern here: privacy and battery life. Shazam says that the app "does not save or send audio samples" - instead a digital fingerprint of the song is matched against Shazam's database. As for battery, we've asked to know exactly how much of a drain Auto Shazam might be on your juicepower, but we understand that the app should demand less power than a phone call. To get Auto Shazam, you'll just need to download the latest version of the app. Can Shazam become the only app you need for TV?